A new range of John Lewis towels made from recycled plastic bottles has been criticised by campaigners, who say they will still pollute the oceans. The retailer will next month become the first in the country to stock towels made from recycled plastic and recycled clothing. The Croft Collection range has been 18 months in development and will be made from 35 per cent polyester from recycled bottles, with each bath towel re-using approximately 11 one-litre bottles. The other component will be recycled cotton. John Lewis estimates that by avoiding the use of virgin cotton, five tonnes of fabric will be saved from landfill each year. But environmentalists have warned the range will only further contribute to plastic pollution. Sian Sutherland, founder of campaign group A Plastic Planet, told The Telegraph the innovation was “well-intended but misguided”. She said: “Every time you wash a synthetic garment, trillions of plastic microfibres wash into our water system. 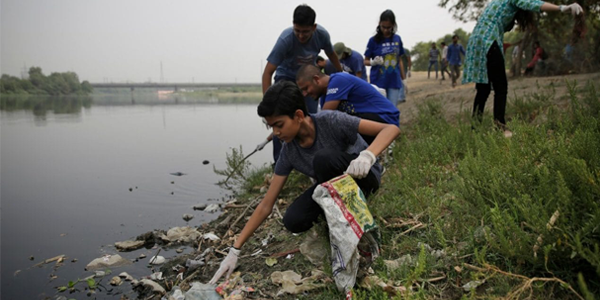 “We know about plastic bottle pollution and single use plastic pollution but the amount of nanoplastic which comes from synthetic fibres is an equally big problem which we’re just becoming aware of. She claimed the use of recycled plastics was “greenwashing” which perpetuated the myth our current use of plastic was sustainable. “The recycling of plastic isn’t a cycle, it’s a downward spiral,” she said. “It’ll all still end up in landfill or in our oceans. “This makes us think it’s fine to use plastic in this way because it’s going to have a second life, but recycling is never going to be the answer. Zoe Brady, Towel Buyer for John Lewis, said: “It took 18 months to develop these towels with our supplier. Initially it was hard to create the soft, luxurious feeling we wanted from recycled materials but we got there in the end. The towels, which range from £5 for a face cloth to £24 for a bath sheet, will come in ivory white, ash grey, and marine green and are certified by the Global Recycled Standard. Plastic pollution, especially oceanic pollution, has come under renewed focus since last year’s Blue Planet II documentary, in which Sir David Attenborough called attention to the environmental devastation caused by the more than eight million tonnes of plastic entering the world’s oceans each year. John Lewis declined to comment about Plastic Planet’s claims.